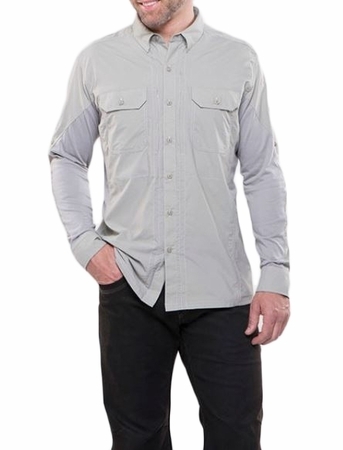 "The KUHL AIRSPEED LS Shirt is a game changer. Hot sun, high humidity, and stifling air are no match for KUHL's collection of AIRSPEED shirts with AirVolution fabric. AirVolution is a woven, technical nylon/poly blend that blocks the sun's harmful UV rays, wicks moisture and dries quickly. It feels like cotton against the skin but boasts all the performance of polyester. The AIRSPEED LS features a button-down collar, button front, adjustable cuff and 2 button-down chest pockets. A zippered security pocket is hidden inside the shirt at the chest, and a built-in custom sunglass cleaner is sewn inside the bottom left placket. Knit panels on the back and front sleeve allow greater freedom of movement. High-tech mesh panels are strategically placed to provide cool comfort and ultimate range of motion. Strategically placed KONCEALER mesh panels increase airflow and comfort with a mesh so fine it can't be easily detected by the casual glance. Kuhls exclusive articulated 5-panel sleeves provide freedom of movement and can be rolled up and secured with the Safari Straps to the button tab. Built-in custom sunglasses cleaner inside bottom left placket"